A rare combination of benefits distinguish Aviation Headset X from all other pilot headsets. Proprietary Acoustic Noise Cancelling headset technology dramatically reduces the engine roar you hear in the cockpit. Small microphones in each earcup monitor ambient sound. Electronic circuitry identifies unwanted noise and creates an opposite signal to reduce it. I can only confirm what has been said here and elsewhere by others. When it comes to service Bose is a real shame. They will NOT ship parts for you to fix it. Send the whole headset at a high cost, get it repaired at even a higher cost. And wait another few years for it to break. Such name like Bose on the market should never ever have any trust from customers, whatever product. When you get answers like the one I just had from Bose Europe, you are so upset and feel so much ripped off that not only you don't want and will never buy any Bose product ever again but you don't want others (particularly fellow aviators, leisure or pro like me) to get the same feeling. When you've spent 1000 USD 6 years ago and have to discard your product now because the only way Bose would accept to have it fixed is to pay what it will cost to buy another product, new, of better quality, from companies offering better services, you feel bad. Don't get scammed, return to trusty David Clark or Lightspeed, and spend money wisely (they cost less anyway). And pass the word on our behalf! BOSE IS A SHAME! 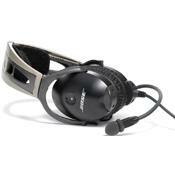 I contacted BOSE to purchase a small plastic swivel (non electronic) for my $1,000 dollar aviation X headset. The part looks like it would cost $2.00 to produce but it wouldn’t have surprised me if they wanted $20 for it (which I was willing to pay). To my astonishment they would neither sell the part or repair it. Apparently the only option is a full priced “refurbishment” of the headset. Some over officious suit started telling me it was a not as easy as it looked and that I couldn’t repair it myself. He then went on to claim that because the product is TSO’d it cannot be repaired by anyone but the manufacturer. Amazingly that isn’t true in the rest of the aviation community. Even if that was true I wasn’t prepared for their solution. They demanded a one time “flat fee” of $175.00 to “refurbish” the headset. Their canned description includes a litany of sugar coated (unnecessary) services apparently hoping to baffle the listener with mindless drivel. The whole story was predictably transparent and completely offensive. After spending $1,000 on a headset I think it is a reckless act of greed to gouge customers another $175 for a $20 part. As a gesture of cooperation they should have either sent me a new one or at least offered to replace it at reasonable cost. I didn’t need or want a bunch of vapor-services, I just needed the plastic swivel replaced. Hey BOSE, let’s call it what it is… a complete gouge and rip-off. Needless to say I will not buy Bose products again. "A rare combination of benefits" is right, if you consider poor engineering and guaranteed failure of components a benefit! I have used three pair of Bose Headsets over two decades of flying, and all three have had components fail. Namely the yokes that are attached to the earcups - they have cracked apart. Also the connectors for the mouthpieces have failed. And, at about three years and a couple months, the ear seals all seem to disintegrate. When I talked to a "Bose Representative," he said, the "new" Bose headsets have "fixed the yoke breakage problem." Then he was quick to immediately add, "...BUT THERE WASN'T A DEFECT IN THE OLDER HEADSET YOKES!" Ah, Yeah, Right. Like Jon Lovitz said as the Compulsive Liar on SNL, "YEEAAAAHHHH, THAT'S THE TICKET! THERE WASN'T A PROBLEM!" The rep was also quick to inform me that "FOR ONLY $175, YOU CAN SEND IN YOUR HEADSET...." For the price of Bose's repair, I can nearly buy a brand new David Clark! If you're looking for a dependable headset, save your money and instantly triple the value by purchasing a David Clark - I've gone back to the H10-20 that I've had for 18 years now, and it still performs flawlessly (Hey, Bose, you might want to check out how David Clark builds their headsets to last, you putz's). PS: If the David Clark clamp gets to your head, check out Aero Air in Scappose, Oregon - they have an excellent line of products that will fix the David Crimp, and you'll still come out WAY AHEAD on Bose's overpriced sewage!